Last year, your class broke all of the library’s book usage records, viewing the eBook A Concise History of the Haitian Revolution, an incredible 1839 times! In other news, your course research guide is here. Please be in touch with any research-y questions! Popkin, Jeremy D. Concise History of the Haitian Revolution. Wiley-Blackwell, 2011. Proquest ebrary. Web. 14 Oct. 2015. <http://www.ebrary.com>. Great to see you in the Schoolhouse earlier! 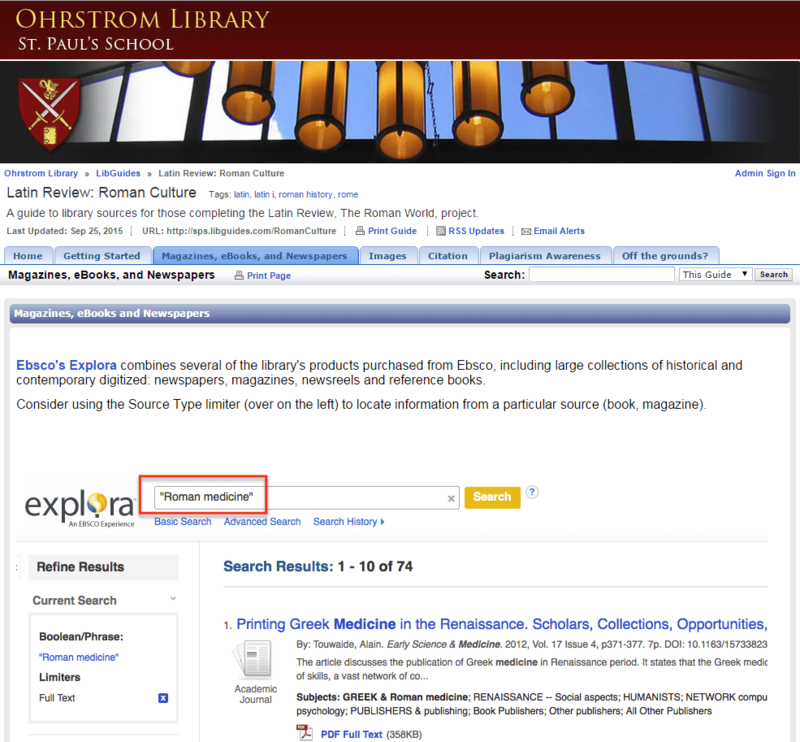 Here’s the research guide for locating library research content about Ancient Roman culture. As we talked about, Ebsco’s new Explora interface is a great place to find many source types on a given topic, including: digitized magazines, newspapers, journal articles, eBook content and possibly even AP newsreels. Ohrstrom Library is now providing access to 35,000 scholarly eBooks available on the well-loved JSTOR platform. To use this collection simply visit JSTOR and search for terms as desired. Enjoy your results with the JSTOR journal articles interfiled, or, extract just the eBook content. “Digital Education – search results.” JSTOR. Web. 14 Sept. 2015. The Ohrstrom Library is very happy to announce its purchase of the The American West. Created by Adam Matthew digital with content provided by the independent archives at The Newberry Library, this archive contains digital content related to the American West including: maps, drawings, pamphlets, diaries and newspapers. The images and documents have been rights cleared for educational use, meaning students and faculty are free to use this content within the SPS educational setting. The American West. Adam Matthew. Web. 5 June. 2014. .